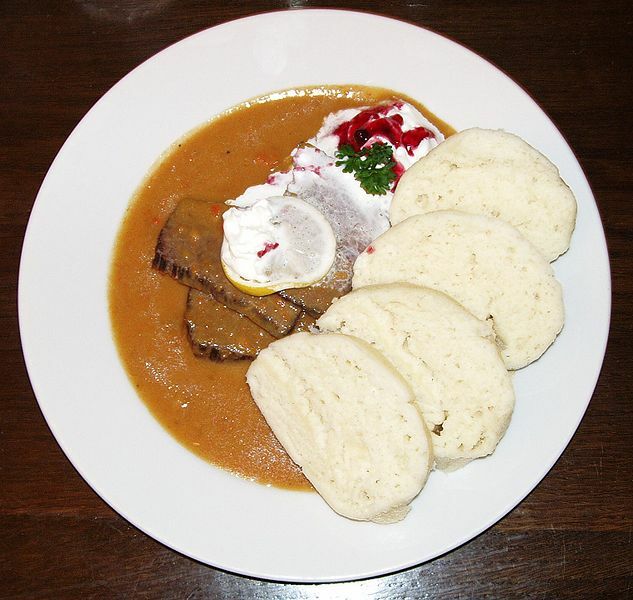 Most of the visitors to Prague want to taste Czech cuisine, dominated by pork, beef, duck and chicken and, of course, dumplings, together with a savoury sauce. Sure, this is what’s famous, but then people start complaining that it’s too heavy. Well, this cuisine is a farmers’ cuisine, and the ingredients enumerated above were the country people’s Sunday lunch, as they could have never afforded to have such sumptuous dishes every day. Today’s tastes have changed and people are much more health conscious. What you see in downtown restaurants’ menus is just a digest of what people use to eat here. I have compiled a little collection of recommendations for restaurants, pubs and cafés for you – typical and traditional as well as unusual and new. Most of the places were tested either by me or our guests – no guarantees, though. For the restaurants and cafés in ARCO Guesthouse’s neighbourhood please see „Our Neighbourhood“. In this article here you will rather find recommendations for downtown and beyond, in case you got also curious about areas off the beaten path. If, starting from the same tram 22 stop you turn left at the next corner, you will see wooden green shop window frames and an entrance saying „Louvre“. This is one of Prague’s grand old cafés, of course one of the favourite haunts of Kafka, as almost every café in Prague pretends to be, but here he really was frequently because of his and his friend’s Max Brod adherence to the philosophical-artistic-political „Salon“ of influential intellectual Berta Fanta. More info from me or Wikipedia. In short, a must. Get the English info sheet at the cloak-room at the entrance on the 1st floor. I will not focus too much on these traditional cafés, as all of them have a story which I will tell you in a different article (For our guests: “Prags Kaffeehausmeile” in German). Suffice it to say that at the next corner, precisely opposite the National Theatre, you find Café Slavia. Get a table at the riverside section and have a great view of the castle when illuminated at night. In a sidestreet of Pařižská, Paris street, Prague’s expensive upscale shopping street, I recommend a very rustic and cosy basement restaurant called Krčma with friendly and English speaking service, lots of regional specialities from all over the country including Slovakia and reasonable prices. It is close to the Jewish museum (Cemetery plus five synagogues, Golem etc., must see) so you could combine the visit. In case you happen to walk along touristically destroyed Wenceslas square (it is still a great square if you know a bit about the buildings and look at some facades), find Vodíčková street 35, that’s on the left of the large Foto Škoda shop, walk into the doorway, follow the corridor till to its end and walk through the Styl & Interier shop to end up in the charming backyard garden of the homonymous café to enjoy some of their impressive choice of coffee and tea. It’s a real getaway sport from the crowds, as is the little Garden Coffee Shop in the Františkánská zahrada, the Franciscan garden, which you reach through the large passage just one building before above mentioned Foto Škoda shop or from Jungmannovo náměstí square, the entrance to the right of the Austrian Cultural Forum. Another refuge is the quiet and romantic Dobrá Čajovna tearoom which you find when passing through the doorway of Václavské náměstí no. 14. If you prefer a some more entertaining place or you’re travelling with children, you should consider Výtopna, farther up on Wenceslas square at no. 56. The name means engine shed, and the reason for this is that the bar and the tables are connected by a miniature railway network that transports the drinks to your table. The food is not necessarily the cream of the crop, but the entertainment factor counts. The old town on the other side of the river is called Malá strana, the „lesser side“, a very old expression dating back to the time when Prague consisted of four separate towns. A good place to eat in the otherwise not so recommendable restaurant scene around the main square of that district, Malostranské náměstí, is the Malostranská beseda, the Lesser town’s culture club, located in the former town hall, with good food and service. Farther up towards the castle is a place I love: U zavěšenýho kafe, „at the hung up coffee“, a café and restaurant that adopted something that is very popular in Italy: You pay one coffee for yourself and one for someone who couldn’t afford it. It’s a cosy place with interesting naive pictures created by a friend of the landlord. It has a smoker’s section but is not smoky. If you happen to walk through the New World or Nový svět, a very picturesque and so far scarcely visited quarter North East of the castle, and it’s later than 2 p.m., go to U raka, named after the crabs they caught when the little creek there was not vaulted yet. It’s a small hotel and café in Prague’s oldest still existing entirely wooden building. It has a little terrace garden, wonderfully arranged with plants and ceramics, it’s totally quiet and you need to ring the bell on the door on the side of the stairs leading uphill. Not cheap, but unique. I wrote a separate, detailed article about Prague’s veggie and vegan restaurant scene, which has a few real highlights. If you book a room at ARCO guesthouse you get it for free. If you speak German, I have Bohemia’s and the Czech Republic’s culinary history for you.